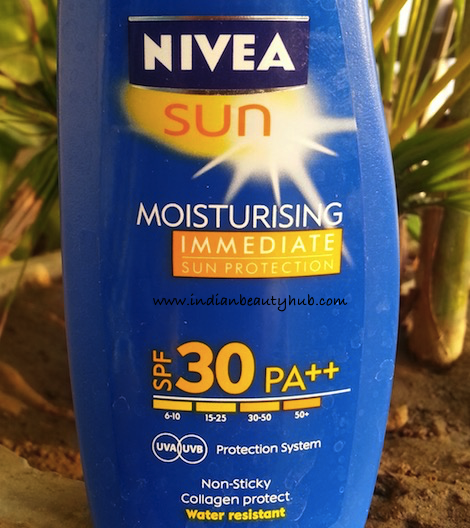 This review is about the Nivea Sun Moisturising Immediate Sun Protection SPF 30 PA++. 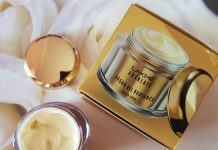 It is a moisturising lotion with sun protection. You can buy it online from Amazon.in or Flipkart.com or offline from your local market shop. 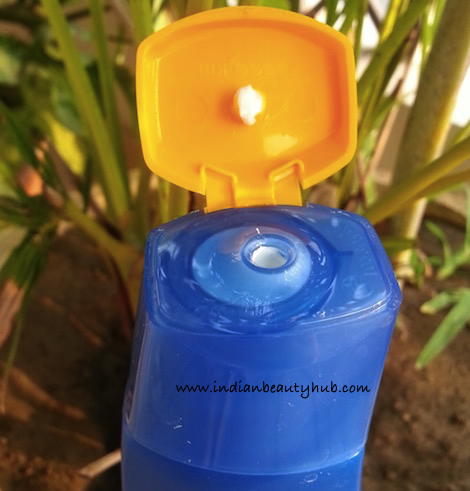 The sun protection moisturising lotion comes in a blue bottle with an orange flip cap. The cap shuts tightly which makes it spill-proof and travel friendly. All the required product information like its claims, usage, ingredients, expiry date, etc is given on the bottle. It comes in a milky white color and has a perfect consistency, neither too thick nor runny. It has a sweet floral fragrance which is not very strong. I generally take a generous amount of this sunscreen lotion and apply it all over my face, neck and arms. 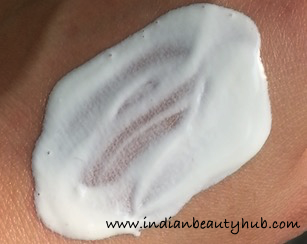 It spreads easily and gets absorbed in the skin completely without leaving any whitish cast on the skin. 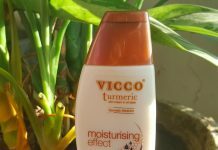 It is very lightweight and doesn’t give sticky or uncomfortable feeling to my combination skin. It comes with SPF 30 PA++ protection system which protects the skin from UVA & UVB rays. 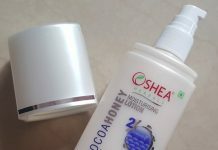 I’ve been using it for the past few months and it doesn’t irritate or cause breakouts to me acne -prone skin. A small amount is required during each use and this 15ml bottle will easily last for up to 2 months. 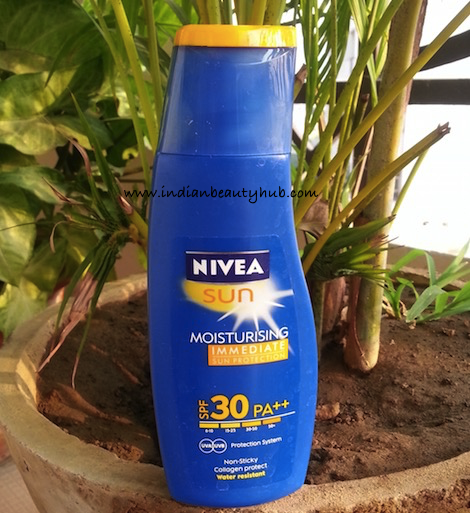 Nivea Sun Moisturising Immediate Sun Protection SPF 30 PA++ can be used by both men and women. People with super oily skin might find it a little greasy during the summers. 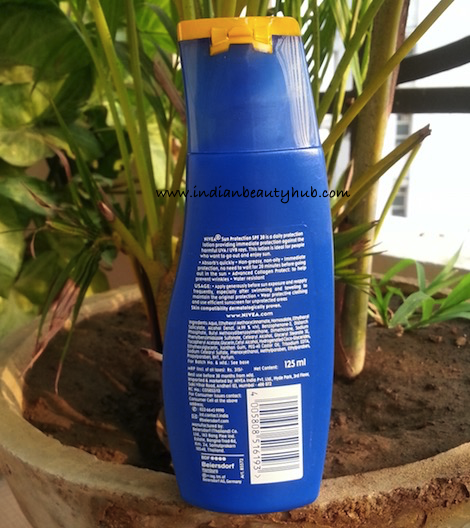 Nivea Sun Moisturising Immediate Sun Protection SPF 30 PA++ Price in India – Rs.200 for 75ml & Rs.315 for 125ml. 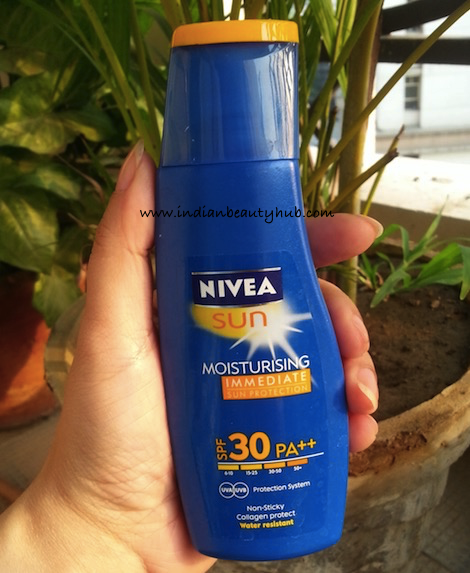 Overall I really liked the Nivea Sun Moisturising Immediate Sun Protection lotion. Its light, non-sticky formula provides adequate hydration to skin and SPF 30 protects the skin from the harsh sun. I recommend this sunscreen lotion for normal, combination and dry skin, whereas people with extremely oily skin should skip this one during the hot weather.